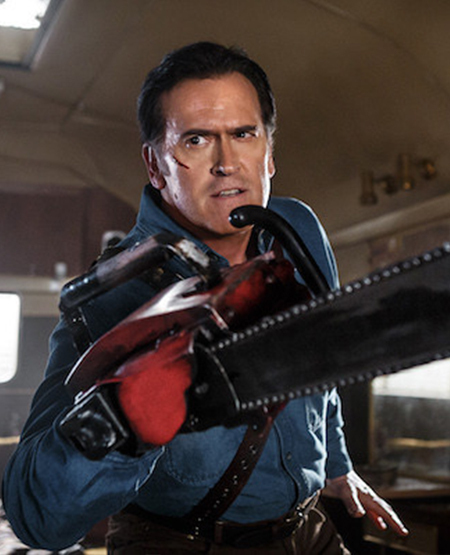 Bruce Campbell is known to fans around the world for his role as the chainsaw-wielding demon hunter Ash from the Evil Dead film trilogy as well as the television series Ash vs. Evil Dead. He is also recognized for genre films such as the Maniac Cop (1988) series, Lunatics: A Love Story (1991), Moontrap (1989), and Mindwarp (1992). Campbell then made his foray into television, first starring in the highly touted Fox series The Adventures of Brisco County Jr. (1993), then as a recurring guest-star on the hit show Lois & Clark: The New Adventures of Superman (1993). Next, Campbell easily made the transition to director, helming numerous episodes and holding a recurring role as the King of Thieves in Hercules: The Legendary Journeys (1995) and its follow-up phenomenon, Xena: Warrior Princess(1995). Bruce has since expanded his range on television, appearing in anything from Disney’s update of The Wonderful World of Disney: The Love Bug (1997), to decidedly dramatic turns on the acclaimed series Homicide: Life on the Street (1993) and The X-Files (1993). At the invitation of ABC, Campbell ventured into the world of sitcoms with a recurring role on ABC’s Emmy-nominated Ellen (1994), participating in one of the three touted “out” episodes. Campbell also had featured roles in the blockbuster Congo (1995), John Carpenter’s Escape from L.A. (1996), the award-winning independent crime drama, Running Time (1997), Paramount’s romantic comedy Serving Sara (2002), Jim Carrey’s The Majestic (2001), and all three of Sam Raimi’s blockbuster Spider-Man movies. After a return to episodic television in the swashbuckling series Jack of All Trades (2000), Campbell took the title role in MGM’s cult sleeper Bubba Ho-Tep (2002). His directorial film debut, Man with the Screaming Brain (2005) premiered on the Sci Fi Channel, then re-teamed with Disney for their fun-filled hit, Sky High (2005). He then directed and starred as himself in My Name Is Bruce (2007), a spoof of his B-movie career. As an author, Campbell has back-to-back New York Times bestsellers: a memoir entitled “If Chins Could Kill: Confessions of a B Movie Actor”, and his first novel, “Make Love the Bruce Campbell Way”. In the multi-media industry, Bruce has enjoyed voicing characters for Disney’s animated TV series The Legend of Tarzan (2001) and the Warner Brothers feature The Ant Bully (2006). He also portrayed the character of “Mayor Shelbourne” in the animated hit film Cloudy with a Chance of Meatballs (2009). Recently, Campbell voiced the role of “Rod Torque Redline” in Cars 2 (2011), the sequel to the smash Disney animated feature and for the immensely popular game, “Call of Duty”. In 2013, Bruce co-produced the hit remake of Evil Dead (2013), joined his filmmaking pal Sam Raimi on Oz the Great and Powerful (2013), and completed an impressive seven-year run on the spy show, Burn Notice (2007-2013), USA’s #1 show on cable.